Step right up and step right into a fully functional, state-of-the art paint booth! On April 24 -26 Automechanika Chicago attendees, will hear that midway-like invitation quite often as Axalta Coating Systems, a leading global manufacturer of liquid and powder coatings, teams up with Global Finishing Solutions (GFS), the world’s leading manufacturer of paint booths, and Automechanika, to provide an interactive paint-mixing and -spraying environment right on the trade show floor in Booth #1034. 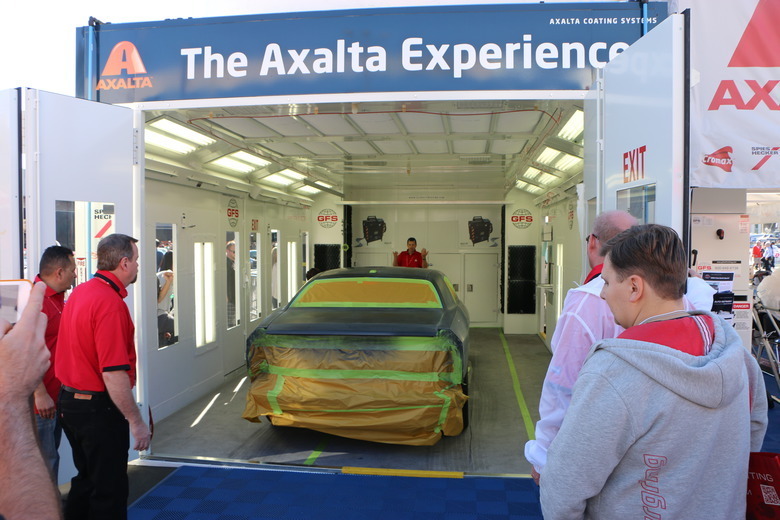 Interested painters are encouraged to take the Axalta challenge and visit the Axalta event website to sign up ahead of time for sessions in the mixing room and paint booth. Each day we will feature waterborne basecoats using one of our global refinish brands - Standox® on Friday, April 24; Cromax® on Saturday, April 25; and Spies Hecker® on Sunday, April 26. In addition to painting, visitors can interact with technical experts or visit Axalta’s main booth (Booth #1302) for an introduction to the Axalta Learning Campus, our ColorNet® formula-retrieval system or our ProfitNet®collision management system. Global Finishing Solutions is the world’s leading manufacturer of paint booths and finishing systems for a wide variety of industries — including automotive collision repair, industrial manufacturing, rail, transit, marine, trucking, wood finishing, military and defense, and aviation. Built on the merging of North America’s most significant finishing equipment manufacturers, Global Finishing Solutions has decades of experience in designing, manufacturing and installing some of the most technologically advanced finishing environments in the world. Dedicated to innovation, Global Finishing Solutions continues to develop new products to help businesses be more productive and efficient. For more information, visit www.globalfinishing.com. Axalta reports on the global color trends for automobiles over the past 60 years! Axalta Coating Systems Ltd. (NYSE:AXTA) today announced that an affiliate of Berkshire Hathaway Inc. (“Berkshire Hathaway”) has entered into a definitive stock purchase agreement with certain affiliates of The Carlyle Group (“Carlyle”) for the purchase of a total of 20 million of Axalta’s common shares for an aggregate purchase price of $560 million, or $28.00 per share. Axalta will not receive proceeds from the sale of the shares. In connection with the purchase, Berkshire Hathaway agreed that it would not dispose of the shares for 90 days following the consummation of the sale. Axalta has agreed to provide Berkshire Hathaway with certain registration rights following the expiration of that 90-day period. The shares are being offered and sold in a private placement pursuant to Section 4 of the Securities Act of 1933, as amended (the "Securities Act"). The shares have not been registered under the Securities Act, or the securities laws of any other jurisdiction, and may not be offered or sold in the United States absent registration or an applicable exemption from such registration requirements. This press release does not constitute an offer to sell, or a solicitation of an offer to purchase, the shares in any jurisdiction in which such offer or solicitation would be unlawful. "We are pleased to have Berkshire Hathaway Inc. take this share ownership position in Axalta," said Charlie Shaver, Chairman and CEO. "Berkshire is the type of quality investor that Axalta has been fortunate to attract since our IPO last year. We believe this investment shows Berkshire’s support of our strategy to reshape ourselves into a growth and customer oriented, world class coatings company." This release contains certain forward-looking statements regarding Carlyle’s agreed-upon sale of Axalta’s common shares to Berkshire Hathaway. Such forward-looking statements are subject to certain risks, uncertainties and assumptions, including the risk that Berkshire Hathaway’s acquisition of the shares from Carlyle may not be consummated, and typically can be identified by the use of words such as "will," "expect," "estimate," "anticipate," "forecast," "plan," "believe," and similar terms. Although Axalta believes that its expectations are reasonable, it can give no assurance that these expectations will prove to have been correct, and actual results may vary materially. These statements involve risks and uncertainties, including, but not limited to, economic, competitive, governmental and technological factors outside of Axalta’s control that may cause its business, industry, strategy, financing activities or actual results to differ materially. Axalta undertakes no obligation to update or revise any of the forward looking statements contained herein, whether as a result of new information, future events or otherwise. Axalta is a leading global company focused solely on coatings and providing customers with innovative, colorful, beautiful and sustainable solutions. From light OEM vehicles, commercial vehicles and refinish applications to electric motors, buildings and pipelines, our coatings are designed to prevent corrosion, increase productivity and enable the materials we coat to last longer. With more than 145 years of experience in the coatings industry, the 12,000 people of Axalta continue to find ways to serve our more than 120,000 customers in 130 countries better every day with the finest coatings, application systems and technology. For more information visit www.axaltacoatingsystems.com. Axalta Coating Systems, a leading global manufacturer of liquid and powder coatings, announced the development of a collection of custom colors exclusively for Peterbilt using special-effect pigments. The line’s signature color, Legendary Red, was featured on Peterbilt Truck Models 579 and 567 in the company’s booth at the Mid-America Trucking Show on March 26 – 28 in Louisville, Kentucky. Peterbilt manufacturing facilities in the United States, Canada and Mexico use Imron Elite to help ensure that repairs can be perfectly color matched at any Axalta commercial repair facility. The identical product is used in the commercial vehicle aftermarket by Peterbilt dealers and repair centers to help exceed customer satisfaction and “repair-in-kind” quality. Axalta is a leading global company focused solely on coatings and providing customers with innovative, colorful, beautiful and sustainable solutions. From light OEM vehicles, automotive refinish and commercial vehicles to electric motors, buildings and pipelines, our coatings are designed to prevent corrosion, increase productivity and enable the materials we coat to last longer. With more than 145 years of experience in the coatings industry, the 12,000 people of Axalta continue to find ways to serve our more than 120,000 customers in 130 countries better every day with the finest coatings, application systems and technology. For more information visit http://www.axaltacoatingsystems.comand follow us @axalta on Twitter. Manufacturing centers of Axalta Coating Systems received certification of conformance with the requirements of the ISO 14001:2004 standard. The certification has been accredited by Lloyd’s Register LRQA and is valid for three years. The certification applies to all 34 of Axalta’s majority-owned manufacturing facilities that produce liquid and powder coatings. ISO 14001 certification provides assurance to employees, customers and corporate partners, as well as to the general public and regulatory agencies, that companies adopt a systematic approach to environmental responsibility. The ISO 14001 program enables organizations to measure the environmental impact of their activities, to set environmental objectives, and to implement assessment and reporting processes to ensure environmental performance is continually improved. In order to be recertified as compliant with ISO 14001 requirements, Axalta underwent a demanding evaluation process in 2014 that included third-party audits at 11 of our 34 manufacturing facilities. The audits focused on site compliance with the ISO 14001 standard as well as compliance with the Axalta global EMS. Each site passed a rigorous evaluation process covering a multitude of procedures, programs and practices within five criteria: environmental policy, planning, implementation and operation, checking and corrective action, and management review. The recertification process culminated in a comprehensive audit in December, 2014 by LRQA of the Axalta global headquarters, during which the effectiveness of the global EMS was assessed. To maintain certification, LRQA will continue to perform semi-annual audits of Axalta’s headquarters and a representative sampling of certified sites to ensure compliance and to assess initiatives for continued improvement. Our customers can be confident that Axalta will continue to provide the high quality products and services they have come to expect well into the future.